Rosa Malloy-Post rides her mountain bike on the Rim Trail on Thursday. Rosa Malloy-Post maneuvers the “GRIT Freedom Chair,” on Rim Trail on Thursday. 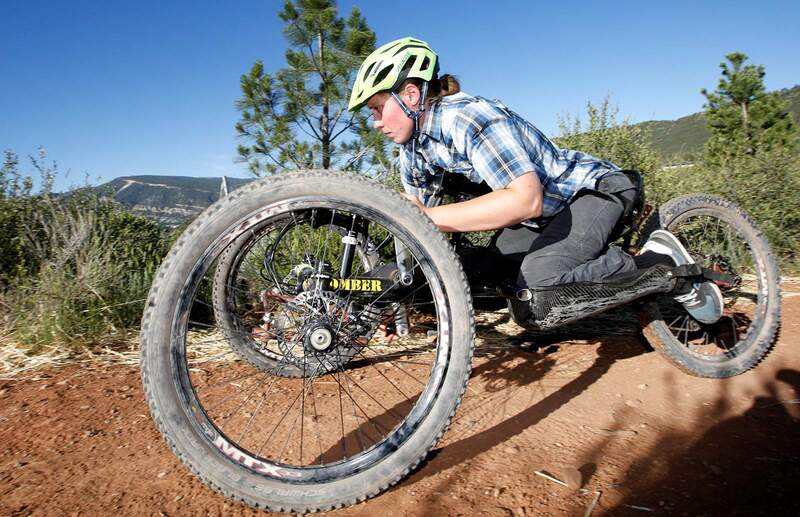 The wheelchair designed to better navigate rough terrain was awarded to her for her outdoor pursuits. Rosa Malloy-Post talks about the differences of the “GRIT Freedom Chair,” left, and her mountain bike on Rim Trail on Thursday. The GRIT wheelchair designed to better navigate rough terrain was awarded to her and she said it should work well for camping, river trips and festivals. Rosa Malloy-Post was 23 years old when she was paralyzed from the waist down after a climbing accident in 2013. The New York native moved to Durango in 2009 to take a job with Open Sky Wilderness Therapy, and she, like many people who find this pocket of Southwest Colorado, immediately took to all the outdoors offers. But on May 4, 2013, Malloy-Post’s life was forever changed when she and a few friends went on a trip to Utah’s Indian Creek. While climbing lead on a route in the Bridger Jack Towers area, she fell and broke her back. For the next two and a half months, Malloy-Post recovered in the hospital. Then she started figuring out ways to not only live independently, but also to sustain her outdoor pursuits. Recently, Malloy-Post was awarded one more tool to help with that effort: a “GRIT Freedom Chair,” a wheelchair designed to better navigate rough terrain. In 2010, a student-led research project at the Department of Mechanical Engineering at Massachusetts Institute of Technology, commonly referred to as MIT, was tasked with finding ways to improve wheelchair performance over difficult terrain. The project took nearly two years, said Tish Scolnik, a former student that was in the group, with dozens of prototypes requiring the feedback of hundreds of people to fine-tune a chair that would meet the demand of many uses. As the students delved more deeply into the project, they realized more and more people were in need of a wheelchair that could work not on just trails, but also backyards, beaches or even on rough walkways. So, after what they deemed a successful design, the students took their wheelchair one step further. 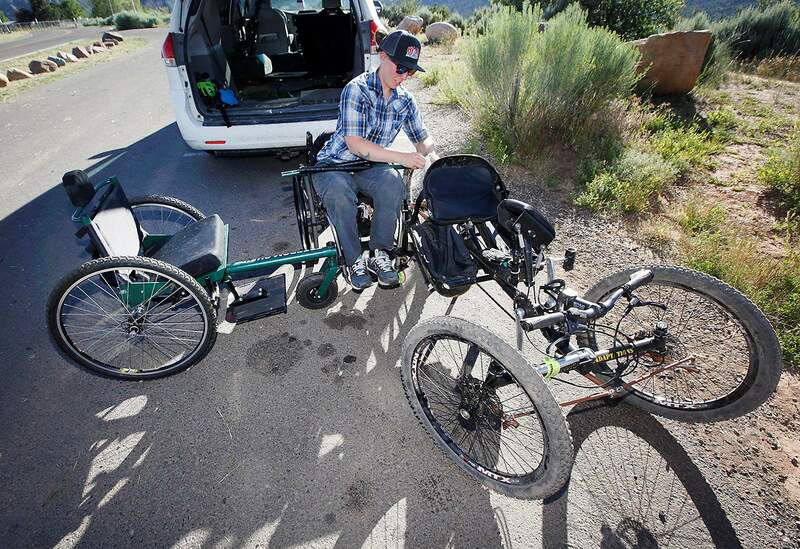 In 2012, they started a company offering its signature “off-road” Freedom Wheelchair, known as GRIT. Last year, Scolnik said the company started the “Pay it Forward” fund, taken from a portion of sales, for people who could benefit from the wheelchair but can’t afford it. Malloy-Post in May was the second recipient of the award, Scolnik said. Indeed, Malloy-Post said she intends to share the wheelchair with any members in the community who could also find it useful. She said those interested should contact Adaptive Sports. Ann Marie Meighan, executive director of Adaptive Sports, said there is all sorts of equipment for people with disabilities as they try to continue with activities that gave them fulfillment pre-injury. 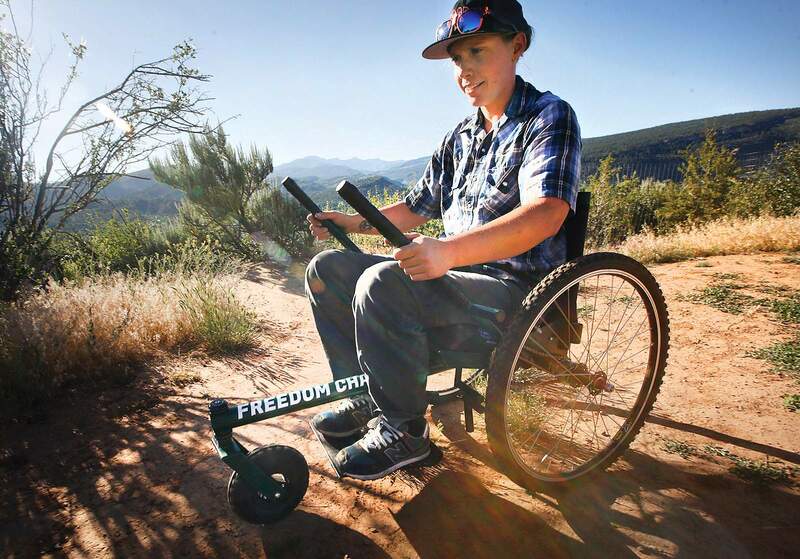 Meighan said the Freedom Chair will likely fill an important gap between traditional wheelchairs and a piece of equipment such as an off-road hand cycle, which is designed for extreme terrain. “This could certainly be the difference between someone being able to move around outdoors independently as opposed to relying on someone else for help,” she said. And for Malloy-Post, it’s been a constant journey to accomplish that independence. After her injury, she enrolled at Fort Lewis College and earned a degree in biology. Now 27, Malloy-Post is constantly spending time in the outdoors when she’s not working as a medical assistant at Mercy Regional Medical Center.